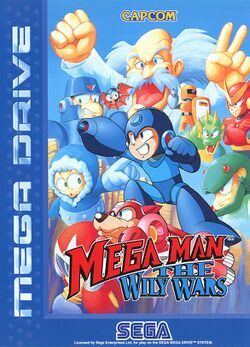 Mega Man The Wily Wars, originally released as Rockman Mega World in Japan, is a 16-bit action platformer. It was released in Japan and in Europe for the Sega Mega Drive, but it was never released for the Sega Genesis in North America. Mega Man The Wily Wars was to Mega Man what Super Mario All-Stars was to Super Mario Bros.: it collected the first three games in the Mega Man series, and updated them with 16-bit graphics and music. When all three games are beaten and saved to memory, an extra game is unlocked with completely new levels and three new robot masters to fight. This game was known as Rockman Mega World in Japan. The use of the word "Mega" in the title is not a reference to Rockman's name outside of Japan, but rather to the Mega Drive, on which the game was released. The three robot masters are known in Japan as the "Mega World Unit". Furthermore, the three robot masters are known in Europe as the "Genesis Unit": this is not a reference to the Sega Genesis, because the name "Sega Genesis" is used in North America only. This page was last edited on 27 November 2015, at 20:48.